UPPER MANHATTAN — The Department of Sanitation will soon reduce its cleaning schedule uptown, under a plan proposed by Community Board 12 earlier this year. 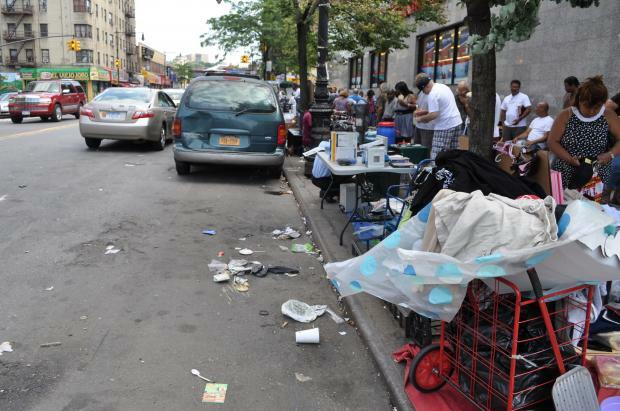 The department announced that it had accepted the community board's proposal to reduce residential street cleanings in Washington Heights and Inwood from four to two cleanings per week, according to the Deparmtent of Sanitation. According to the DSNY, the reduced street cleaning schedule will mean residents only need to move their parked cars once a week per each side of the street. Street cleaning in commercials areas will be increased to six times a week, Monday through Saturday, and will now take place during the day instead of overnight, according to the department. Trash pick up will continue at its normal schedule. CB12 is the first community board in the entire city to ask the city to reduce its street cleaning, the Sanitation Department said. The board's Health and Environment Committee voted to reduce street cleanings in the neighborhood last November after the district finished the year with a cleanliness rating of 95.9 percent, which was comparable to other districts in the borough. Although the plan was approved by the board, some residents and community leaders said they found the new plan frustrating and counterintuitive for a community that has struggled with the highest reported rates of rats in the borough. Cheryl Pahaham, CB12’s vice chair at the time, argued that Inwood and Washington Heights already struggle with an epic rat problem, filthy streets and sidewalks with overflowing trash, and food grease from street vendors commonly spilled out on sidewalks and streets, and cannot afford to limit cleaning services. “I don’t feel with our current habits the way they are that we’re ready to ask the Department of Sanitation to reduce the amount of times we clean,” she said when the plan was approved by the board last year. Editor's Note: An earlier version of this story indicated that street cleanings would be reduced to four cleanings per week on residential streets.